Learn how to make the easiest (10-minute prep) fall-off-the-bone slow cooker ribs that will have everyone licking their fingers & plates! This is the best method for fixing bbq ribs if you don't own a smoker or it's cold outside. Cook the ribs in as little as 4 hours using the high setting on your crock-pot. Use your favorite rack of ribs (spare, country style, baby back, beef) and barbecue sauce for an easy comforting meal any night of the week. I'm betting you're here because you either love ribs or want to cook a rack for someone else who does. If so, you're in the right place! Why? Ribs are my absolute favorite food. Smoked pork ribs, to be exact, but those are a labor of love (hours of babysitting the smoker/charcoal grill to make sure it stays at a consistent temp). Which is totally worth it to me because I'm from Kansas City (barbecue capital of the world) and it's hard to find good smoked barbecue near me that compares (sorry, Dallas). So, when I can't fix my own smoked ribs (weather & time plays a part), my second favorite method for making ribs is in the slow cooker. NOT the oven. Big fat nope on that one. Why Make Ribs in a Slow Cooker Instead of the Oven? Every time I've tried the oven, the ribs don't turn out tender enough and the meat tastes very "meh". Probably because it's cooked at a lower temperature covered in foil, so the outside hardly develops any caramelization. In contrast, ribs cooked in the crock-pot yield meat that is fall-off-the-bone tender, juicy, and flavored with fat (this is part of the reason why I like St. Louis style spare ribs the best). You don't want tough and dry meat. 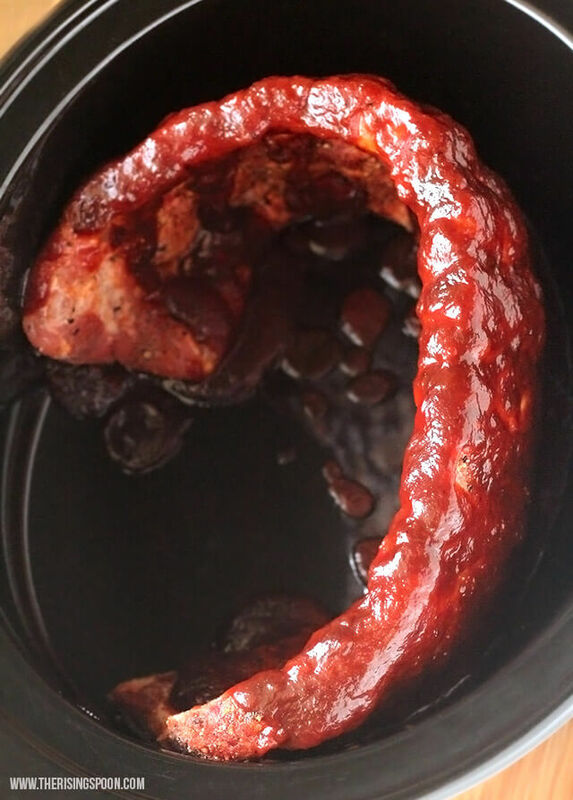 And cooking it on the HIGH setting in a slow cooker helps to create a bit of caramelization on the edges of the ribs from the barbecue sauce that has dripped down. First things first, you have two options when it comes to ingredients: store-bought or homemade. If you have access to high-quality spice blends and bottled barbecue sauces, using store-bought ingredients probably seems like a no-brainer. It also cuts down on the prep time (only 10 minutes), which is a big bonus. 1. Use a Barbecue Sauce You LOVE. You want it to taste REALLY GOOD. This is important! Don't use a BBQ sauce that makes you feel "meh". PUH-LEASE choose a brand (or homemade recipe) that knocks your socks off and makes you want to dip every dang thing in it. The barbecue sauce is a key ingredient here since there is no smoke involved. Why? The BBQ sauce thickens and reduces down while in the crock-pot, almost forming a glaze on the ribs. That thickened sauce + tender meat + background of rub spices = all the flavor. Lately, I've been doing a combo of Trader Joe's Organic Kansas City Style Barbecue Sauce and either Rufus Teague's Blazin' Hot or Lillie's Hot Smoky Memphis-Style with Heat. It would also be EXCELLENT with Oklahoma Joe's Original Barbecue Sauce or Night of the Living BBQ Sauce (my favorite of theirs). 2. Use Your Favorite Type of Ribs. You have quite a few options and they'll all work in the slow cooker (as long as they fit). My favorite cut is St. Louis style pork spare ribs because they're meatier and have a bit more fat, which means more flavor. 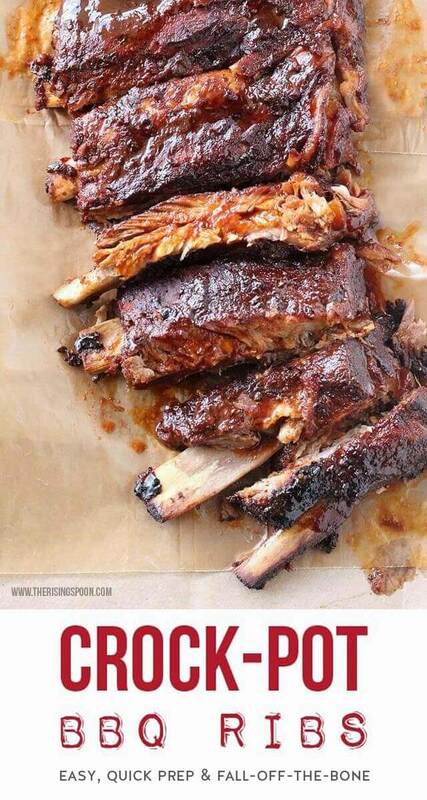 You can also do baby back ribs if you prefer more ribs on a rack with less meat on each bone. Another popular option is boneless country style ribs (probably because they go on sale often). 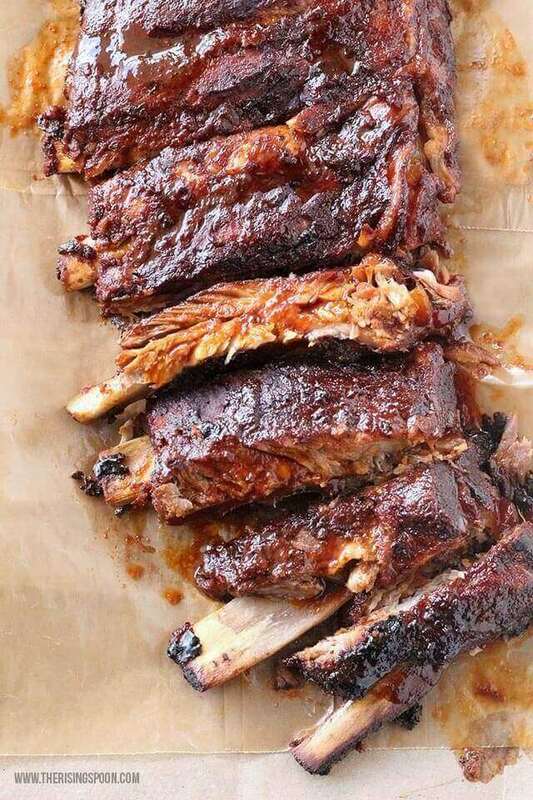 TIP: Ribs freeze well so if you find them on sale, buy several racks at once so you can keep them on hand for slow cooking, grilling or smoking. You could also opt for beef ribs if you're avoiding pork. My recipe is based on St. Louis-style specifically, so if you switch up the variety used, check on them an hour earlier in case they cook faster. 3. For Extra Caramelization Finish The Ribs Under The Broiler. Using my slow cooker on the high setting tends to char/caramelize the edges of the meats I cook in it (like pork shoulder or Mississippi roast, for example). But from reading the copious Pinterest "tried it" comments on this recipe, it seems that lots of folks don't get the same charring results. There's an easy fix for that though! 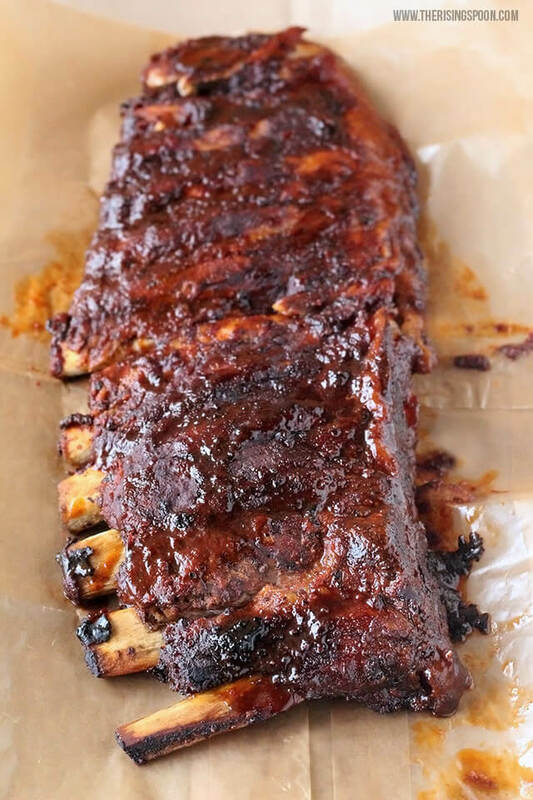 You'll want to gently place the rack of ribs on a baking sheet (it should be practically falling apart), rub the top with a bit of extra barbecue sauce, and stick the ribs under the broiler for 3-5 minutes to caramelize the sauce. 4. If You Skip The Barbecue Sauce, Use a Really Good Dry Rub. 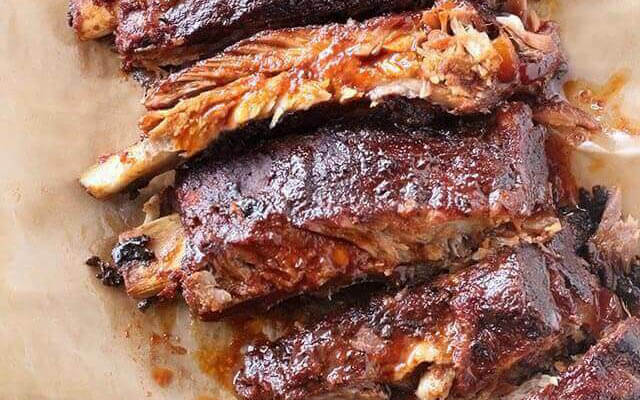 The barbecue sauce adds the majority of the flavor when you fix ribs in a slow cooker, but you could definitely make a dry rub the star and serve extra barbecue sauce on the side instead. You'll want to do a thick coating on both sides of the ribs and probably remove the membrane (silver skin) on the back, as well. At the end of cook time, pop the rack under the broiler in the oven for 5-ish minutes to let the sugars in the dry rub caramelize a bit. You'll have plenty of extra time while the ribs are slow cooking, so why not make an easy side dish or two to serve with the meal? Before you jump into the instructions, make sure to watch my short recipe video by clicking below. 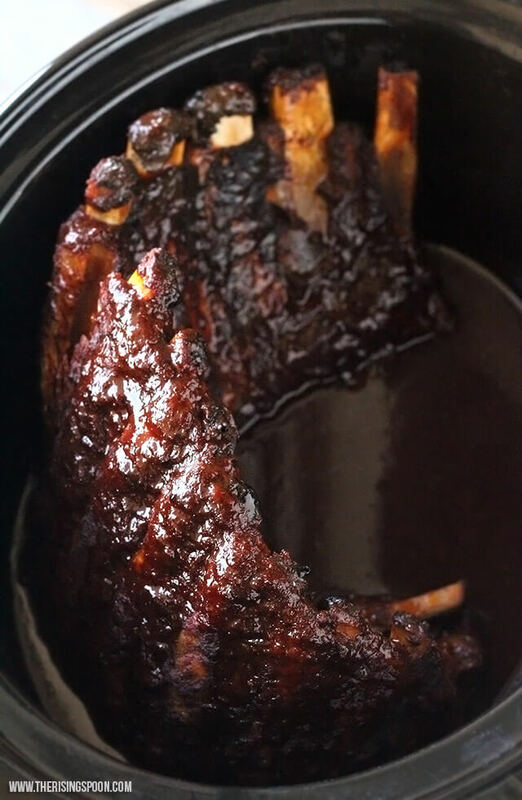 It illustrates the super easy process of making these crock-pot BBQ ribs! *The barbecue sauce is a key ingredient here (since the ribs won't have any smoke/grill flavor), so make sure to choose a brand or recipe that you LOVE! I often mix a smoky and sweet Kansas City-style sauce with a spicy barbecue sauce for a good balance of sweet and spicy. And if you're following a Paleo or Whole30 diet, you'll likely want to make your own barbecue sauce so you can control the ingredients in it. 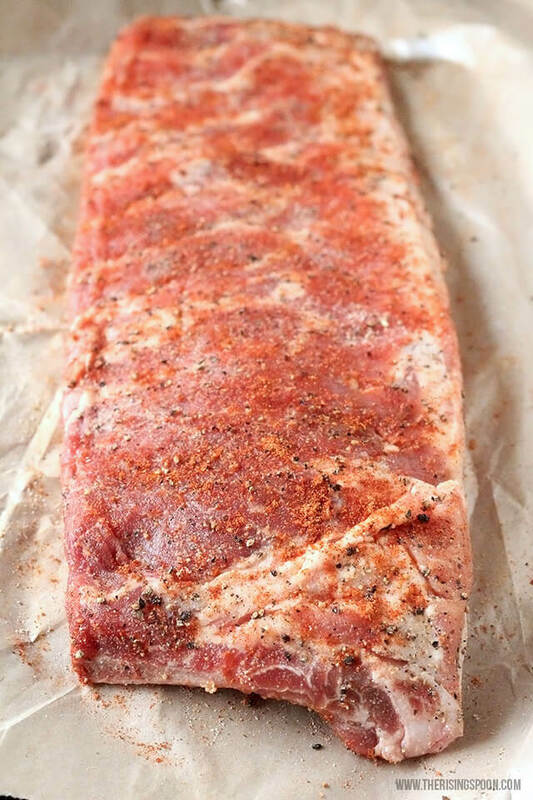 Season your rack of ribs with salt, black pepper, garlic powder, onion powder, and favorite seasoning blend. Feel free to use my measurements as a guideline and add more if you want a thicker coating of dry rub. Place the ribs in the crock-pot on their side (standing up) with the meatier side facing the inner wall. Close the lid and cook on HIGH for 4 hours or LOW for 8 hours or until the ribs are very tender (meat easily comes off the bone and/or the ribs separate without much effort). 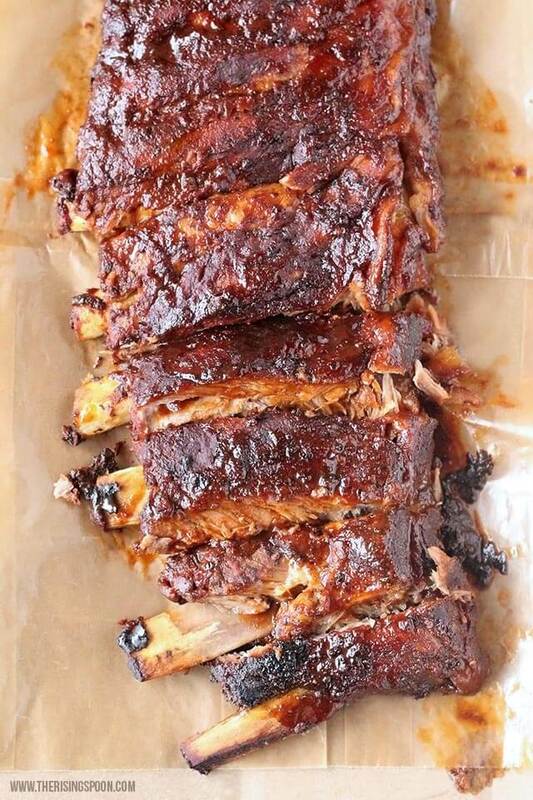 To serve, gently move the ribs to a large platter or baking sheet and spoon some of the cooking juices all over the rack, making sure to supply extra barbecue sauce on the side for those who want it (I never end up using more). Store any leftover ribs + the cooking juices in the fridge. To reheat, place the ribs in an oven-safe baking dish, spoon over more cooking juices, cover with a lid or foil and bake at 350 degrees until warmed through (about 30 minutes or so). Reheating covered in the oven helps to keep the meat juicy and tender, whereas other methods (like the microwave) may overcook and dry out the ribs. Cooking time may vary slightly depending on the size of your crock-pot and ribs. If your slow cooker typically cooks faster, check on them earlier. If your ribs are bigger, give them an extra 30-60 minutes or more. If you want to double or triple the recipe (you may need to adjust cooking times) you should have enough room for 2-3 racks of ribs when they're placed in the slow cooker this way. My guy & I can polish off 2/3 of a rack at this weight by ourselves served with small portions of sides (like salad and mac n' cheese). You could definitely stretch it to serve 4 people if you give each person a smaller portion of ribs and serve with 2-3 larger portioned side items. Click Here To Pin This To Your Slow Cooker/Crock-Pot Board On Pinterest!